If you have read my recent post about the excellent antibacterial and antifungal qualities of propolis, you may be wondering what propolis products you can use to treat vaginal yeast infections. There are different rectal suppositories available, but I was looking specifically for a vaginal treatment, and I found it! The company is called Bee Healthy Farms and they sell exclusively natural honey bee products, they also offer a selection of propolis based remedies. Among them, I found Provules, propolis suppositories for vaginal use. 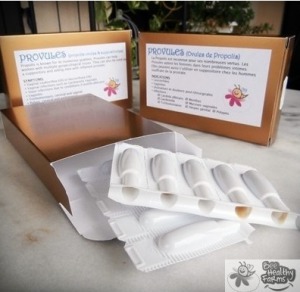 According to the producer, the propolis suppositories (pessaries) treat different gynecological conditions, such as vaginal yeast infections, bacterial infections, and herpes. I like the fact that the ingredients are simple and 100% natural: propolis, cocoa butter, and beeswax. Provules are participating in a 3-year study at the Malaysian University Medical Center focusing on its effect on vaginal bacterial flora. The dosage is safe enough to use the suppository every night until you recover. Later you can use it twice a week to maintain your balanced vaginal flora. Make sure you consult your doctor before starting treatment. A few minutes after insertion it can give a burning/stinging sensation, which can be a bit uncomfortable but is perfectly normal for propolis containing suppositories. If the burning doesn’t subside or gets worse, it’s best to remove the suppository. Not suitable for people allergic to bee products. Always use underpants as you will get a waxy discharge the morning after. Propovules are a very effective natural remedy against vaginal yeast infection. There is a lot of evidence that shows potent antifungal qualities of propolis. You might not see the results straight away, but give it two or 3 nights and your symptoms should disappear. You can buy Provules at beehealthyfarms.com. Thank you very much for this information Jean-Francois! What do you think of using this while pregnant?? Any side effects like labours etc? I tried to contact the manufacturer, but I still haven’t heard from them. There’s no information on the box, so if I were you I would consult a doctor before using them while pregnant.